Bush’s body was transported by a motorcade Monday morning from a Houston funeral home to Ellington Field Joint Reserve Base, a Texas Air National Guard base. The casket was loaded onto a plane during a departure ceremony and flown to Joint Base Andrews in Maryland. Relatives accompanying the casket included his sons, former President George W. Bush and Neil Bush, along with members of their immediate families. Former Florida Gov. Jeb Bush and the rest of the Bush family met the party when the body arrived at Joint Base Andrews. 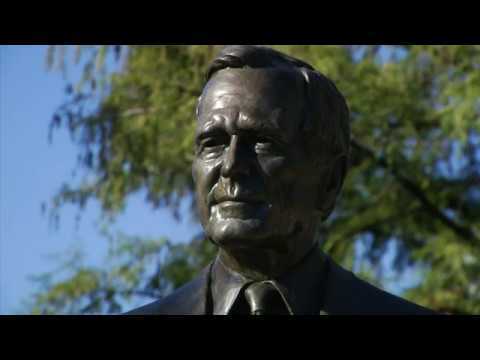 Houston hosted a public tribute to Bush on Monday night. Mayor Sylvester Turner had urged attendees to wear colorful socks, a nod to the former president’s fondness for sporting loud socks often emblazoned with unusual patterns during public events. Family spokesman Jim McGrath tweeted Monday that Bush will be laid to rest wearing gray socks honoring his days as a naval aviator. In Washington, Bush is lying in state in the rotunda of the U.S. Capitol until 8:45 a.m. EST Wednesday. His casket will be transported by motorcade Wednesday morning to the National Cathedral, where a state funeral will be held at 11 a.m. EST. President Donald Trump, who ordered federal offices closed on Wednesday for a national day of mourning, is to attend with first lady Melania Trump. The locomotive has been painted the colors of the Air Force One plane used during Bush’s presidency and bears the number “4141” in honor of the 41st president. The casket will be in a car with Plexiglas windows to allow people to see it during the trip, according to McGrath, the family spokesman.